Guilds includes 13 randomizer cards (one for each Kingdom card in Guilds). 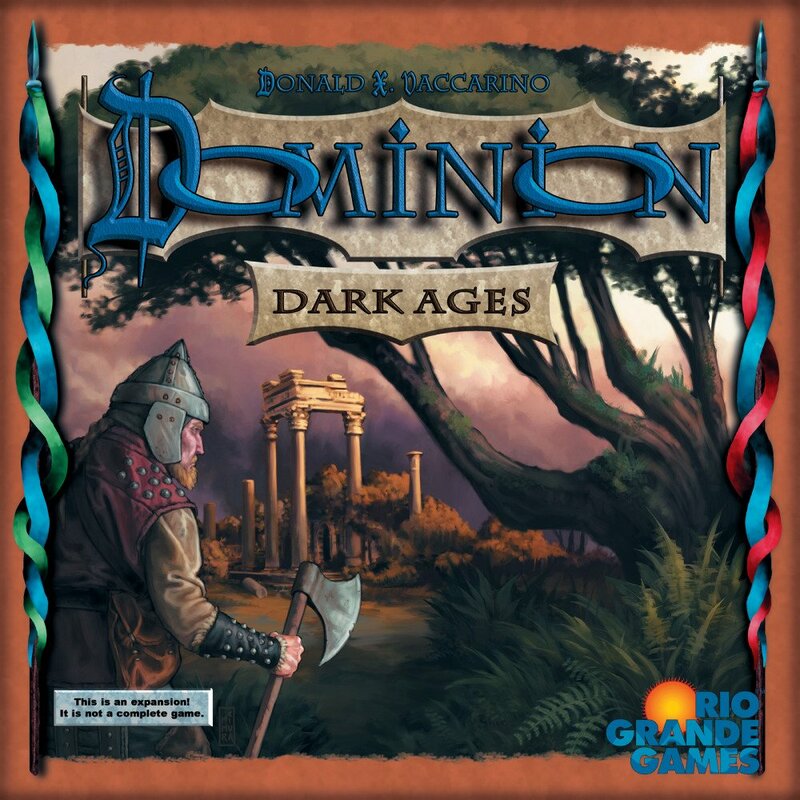 Players will need the Treasure cards, Victory cards, Curse cards, and Trash card from either Dominion, a standalone expansion to Dominion (e.g., Dominion: Intrigue), or the Base Cards set to play with this expansion. As with previous Dominion games, players must choose 10 sets of Kingdom cards for each game. 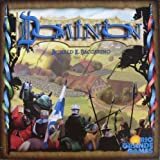 If players choose the random approach for choosing sets, they should shuffle the randomizer cards from this expansion with those of any other Dominion games they choose to play with. If Baker is being used this game, each player starts the game with a single coin token. Otherwise, each player starts with no coin tokens. In play - Action cards and Treasure cards played face-up to a play area are in play until they are moved somewhere else — usually until they are discarded during a Clean-up phase. Only played cards are in play; set aside cards, trashed cards, cards in the Supply, and cards in hands, decks, and discard piles are not in play. Reaction abilities do not put those cards into play. Some cards in Dominion: Guilds give players Coin tokens. Coin tokens always come from the supply of tokens, not from another player. In a player's Buy Phase, before buying any cards, that player may spend any number of Coin tokens; each Coin token spent gives that player + . Spent tokens are returned to the supply of tokens. Coin tokens are not componentlimited; players may use a substitute if they run out. 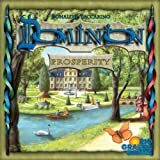 They are the same tokens that come with Dominion: Seaside and Dominion: Prosperity, but abilities that give players Coin tokens cannot be used to put them on Pirate Ship mats or the Trade Route mat. They can only be spent in a Buy Phase; they cannot be spent when buying a card via the promotional card Black Market. Some cards in Dominion: Guilds can be "overpaid" for. The costs for these cards have a "+" next to the coin symbol. A player may pay any additional amount for such a card, and then gets an effect based on how much extra was paid. Potions (from Dominion: Alchemy) may be used in overpaid amounts if desired, although this is not always meaningful. A player may choose not to overpay, even if she has extra coins, but cannot choose to overpay ; to overpay, a player has to actually pay more than the cost. The coins used to overpay are gone after spending them to overpay; they cannot be then used to buy something else. Overpaying happens when a card is paid for, which is before it is gained. Players can only overpay for a card when buying it, not when gaining it some other way. The "+" is just a reminder; a card with "+" in the cost still has its normal cost for all purposes. For example if a player plays Haggler (from Dominion: Hinterlands), then buys a Masterpiece, overpaying, Haggler will still gain her a card costing less than , the cost of Masterpiece. Similarly, Masterpiece could be the Bane card for Young Witch (from Dominion: Cornucopia), since it costs . Reducing the costs of cards via cards like Bridge (from Dominion: Intrigue) or Highway (from Dominion: Hinterlands) does not interact with overpay; for example, if you play five Bridges and have total to spend, Herald would cost , but if you bought one the most you could overpay for it would still be . When two things happen to a player at the same time, that player picks the order to do them. For example, if a player with Merchant Guild in play buys a Masterpiece, she chooses whether to take a Coin token first, or overpay for Masterpiece first (in this case the order would not actually matter, since it is too late to spend the Coin token). When two things happen to different players at the same time, go in turn order, starting with the player whose turn it is. For example, if a player plays Soothsayer with only one Curse left in the Supply, the player to her left gets it. At any point in the game, if a player has to do anything regarding her Deck (draw, reveal, set aside, look at, or trash cards), and she needs more cards than are remaining in her Deck, she must do as many as she can and then shuffle her face-up Discard pile to form a new face-down Deck. Then, she does the things with the remaining number of cards from her newly shuffled Deck. If a player’s Deck is empty, she does not shuffle her Discard pile until she needs to do something with cards from her Deck and cannot.